Length: 152mm. Image shows assembled and painted kit. 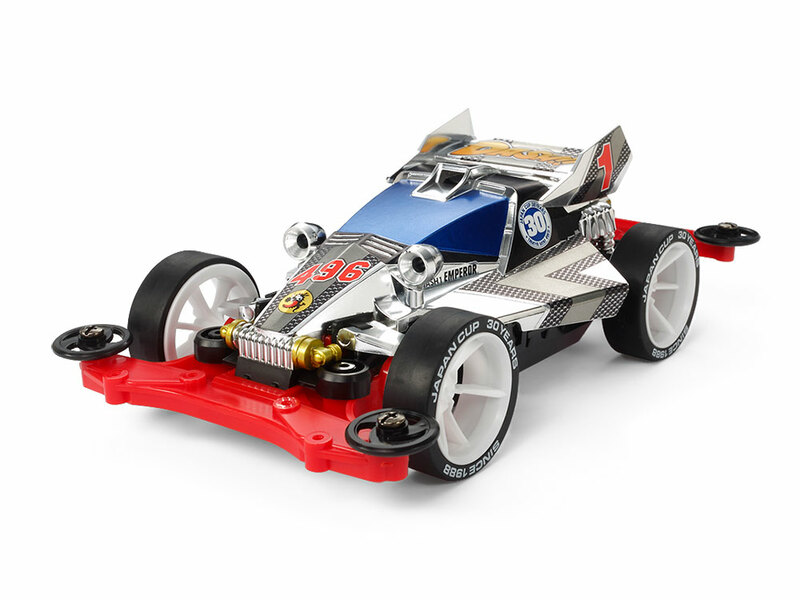 This kit creates a special version of the Dash-1 Emperor Mini 4WD kit, in commemoration of 30 years since the running of the first Japan Cup! The unmistakeable Dash-1 Emperor body is given a snazzy metal-plated finish, and metallic stickers for decoration are included in the kit. It is based upon the MS chassis with N-02 and T-01 units in red, plus the center unit in black. White 6-spoke wheels are paired with super hard low-profile black tires featuring sidewall lettering. The MS Chassis has its double-shaft motor and batteries mounted in the center of the chassis for optimum weight distribution and superb stability at high speeds. The nose, center, and tail units are designed for easy attachment/detachment, allowing quick setting adjustments. Here, the MS chassis has a gear ratio of 4:1, and comes with 16mm rollers. Information is correct as of July 17, 2018. Specifications are subject to change without notice.